Sunday 21 January. 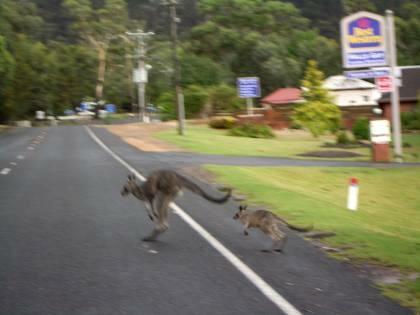 Kangaroo and baby hops across road by Hotel. 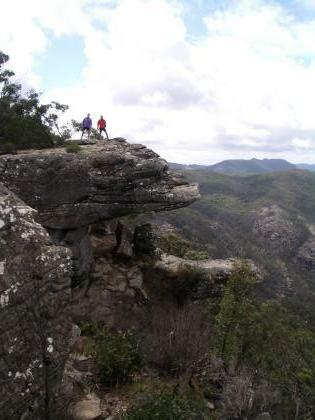 We stayed 2 nights in Halls Gap town in the middle of Victoria's Grampian Mountains so today was a rest from moving on. We were up early for Breakfast at 7.30 and as we left the rooms block to walk over to reception we spotted 4 Kangaroos grazing on the Hotels front lawn. 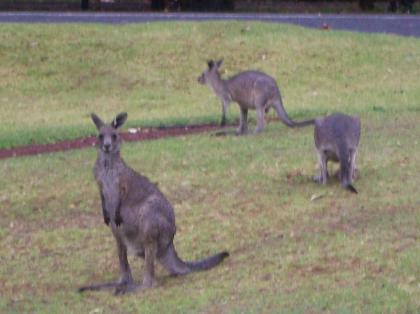 These were wild Kangaroos which had taken advantage of the quiet period overnight to move in on green lawns. We were able to get within about 12ft of them to take pictures. With a low pressure front over the area there was intermittent rain all day with temperatures up to 25C. We had a short bike ride but just to the National Park Visitor Centre up the road. We took in the Visitor Centre and the adjoining Aboriginal Culture Centre. Then back to town for lunch. 5.1 miles for the day. Friday 19 January. Ararat to Halls Gap. 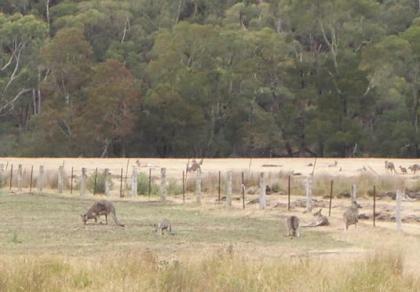 Kangaroo spotting day. Rain continued all night much to the relief of locals fearful of bush fires. Luckily for us it cleared by morning. We were able to ride rain free until elevenses but there was some light rain after that for a couple of hours before clearing. 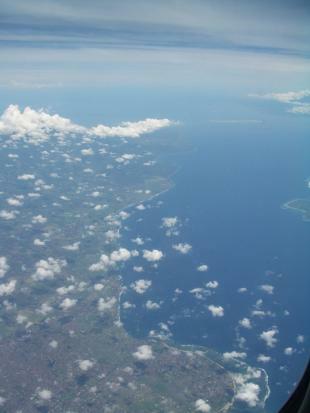 Temperatures reached 30C and again very humid. We rode into town for breakfast and then took the quiet minor road C222 towards the Grampian range of mountains. The last few days we had been searching the undergrowth as we cycled along for Kangaroos without success. Today we ended the day saying "not another Kangaroo"
A few miles from the start of the ride Peter T was busy taking pictures of a roadside sign warning of Kangaroos while a few hundred yards up the road the rest of us were busy taking pictures of a herd of about 6 Kangaroos grazing in the distance on a hillside. 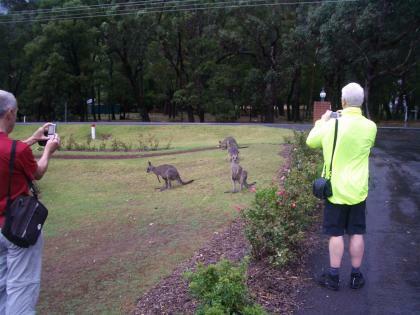 Martin promptly scared them off by shouting Kangarooooos!!! At the top of his voice and they all hopped off between the trees and over the ridge. We continued on to the small bush village of Mayston for coffee. 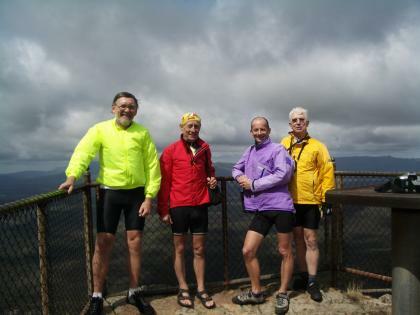 A local who was into cycling chatted with us and gave us some tips on our planned route. We continued north on a flat route parallel with the Grampian Mountains to our left. 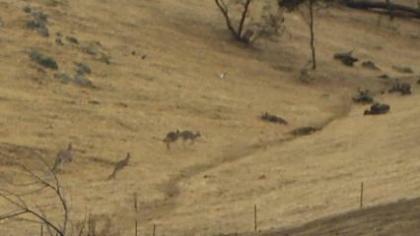 Suddenly a Kangaroo appeared on the verge a few yards away. It skidded to a stop, hopped down the verge and across the road behind us and then hopped over a farm fence and raced off along the field. It was incredible to watch as it gracefully gained the speed of a racehorse with it's hops. Martin was behind us and had spotted his own Kangaroo at a distance which didn't move and he videoed it and took pictures. We stopped for lunch at a General Store combined with a Caf? at the small village of Pomonal. A few miles up the road Martin spotted a field of Kangaroos. They were at quite a distance but spotted us, probably noticing the bright yellow coat worn by Peter W. They started hopping across the field jumping farmers fences with ease. There must have been a good 60 in the herd. Nearing Halls Gap 2 Kangaroos were spotted on the road 100 yards ahead of us. 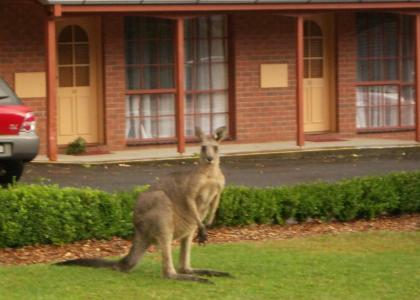 While I checked into the Best Western Colonial at Halls Gap the others viewed Kangaroos grazing the field next to the Hotel. This was clearly Kangaroo day and really made us feel we were in Australia. 31 miles for the day and only 780ft of climb. Thursday 18 January. Maryborough to Ararat. Pyrennes Highway. Today's ride was dry and cloudy with sunny spells and temperatures up to 35C and very humid. Luckily a torrential downpour held off until evening. Although a major route the road had light traffic, about a car every 3 or 4 minutes and a lorry every 15 minutes. After 15 miles we stopped at the Bush Town of Avoca for elevenses at a bakery and caf?. The days ride had similar scenery with a mix of dried out grasslands with gentle hills in the distance and gum tree woodlands. One road sign warned of Kangaroos for the next 66 Kilometres. Then another sign warned of Koalas for the next 15 Kilometres. We switched from looking towards the base of trees for sleeping Kangaroos to looking at the branches of trees for sleeping Koalas. No luck on either count. A picnic lunch was taken at picnic tables in a park in a village called Amphitheatre. Peter W and Martin were noted to fall asleep on the park benches! The ride in the afternoon was notable for the screeching of alarmed white Cockatoos and Parrots as we passed. We also saw our first kangaroo in the wild but unfortunately it was dead at the side of the road presumably killed by a car the previous night. I took pictures of it but so as not to cause upset to Kangaroo lovers I am not putting it on the blog. We stopped for a drink at a hotel bar in the small village of Elmhurst. We arrived at another Best Western at Ararat by soon after 6.00. 56 miles for the day and 1607ft of climb. Today was an easier ride than yesterday with fewer hills and cooler at only 35C! Weather was cloudy but dry. We headed north on a back road into the Victoria Gold rush area. The road was mainly flat on a high plateau. We stopped for elevenses at the old gold mining town of Clunes. This looked like an American ghost town in places but a lot was still open including great tea rooms where we settled on comfy sofas and some members of the group nodded off. We headed on into rolling countryside a mix of parched ranchland and gum tree woodlands with signs warning of loose Kangaroos but despite keeping our eyes peeled none were spotted. We found a wooded gateway for a picnic lunch. 2 miles down the road a sign for Tea Rooms was spotted at the side of the road so we quickly peeled off to the adjoining town of Talbot where the London House Tea Rooms was open offering Devon Cream Teas. I settled for a Hot Chocolate topped with Marshmallows and a slice of Apple Cake. We continued to the town of Maryborough and an early 3.30 arrival at the Bristol Hill Motor Inn. 42 miles for the day and 879ft of climb. Tuesday 16 January. Melbourne to Ballarat. Today we started early to catch the 07.13 V.Line train west from central Melbourne to get us out of the urban area. The trains came with a special bike area and no pre.booking or payment was required. With a train going out of the City at rush hour it was nearly empty. After leaving the train we went into Baccus Marsh town for breakfast. The town was very much small town Australia. Then on quiet backroads to the south of the main freeway heading west. Temperatures during the day were gradually rising getting much higher than yesterday at 40C under searing blue skies. We also experienced near gale force northerly winds often as headwinds. With little time to adapt after an English winter the summer heatwave temperatures today were a shock to the system for all of us. The ride out of Baccus Marsh and for much of the day was notable for the frequent sightings of birds including white cockatoos and many types of Parrots. 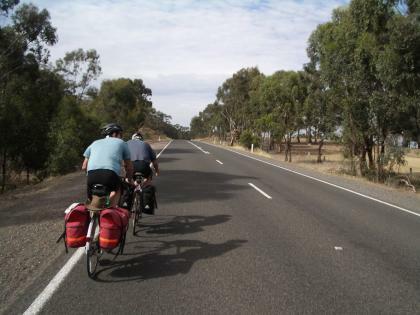 We also often rode along roads lined with gum trees. Signs warned us of a hill ahead with serious grades not suitable for heavy vehicles. This lived up to its advert with grades up to 19% and climbing over several miles to 1500ft. We had lunch at the top from our supplies. One driver stopped and asked us if Peter W was ok, lying out flat exhausted a few hundred yards down the hill from us. We told her that was fine, quite normal. After a few miles we turned on to a road going due north into the gathering northerly headwind for 9 miles. Peter W got part way and then lay down beside the road and was given a lift by a kind local in a Roadside Rescue vehicle!! all the way to the hotel in Ballarat. The rest of us stopped in a caf? as near as possible to the chiller cabinets and then continued in the gathering heat with more and more frequent rest breaks in the shade. We continued on really quite byroads which were very good cycling routes with signs warning of wild Kangaroos and even once of wild Kolas. We didn't spot any and decided they must be very sensibly sleeping in the shade. We eventually arrived at our comfortable Best Western Hotel in Ballarat at 7.15. 49 miles for the day and 2782ft of climb with 20% maximum grade. Tuesday 16 January. 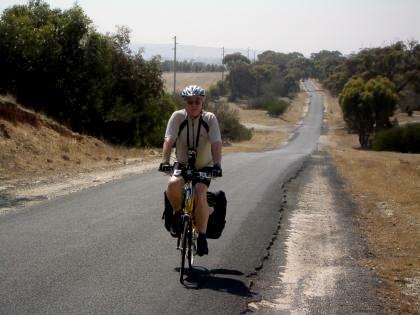 Peter on the road to Ballarat. Monday 15 January. Rest Day.Melbourne. Then on to the Rialto Tower an 820ft office tower with an observation deck where we had great views of the City centre and had lunch in the Caf? at the top. 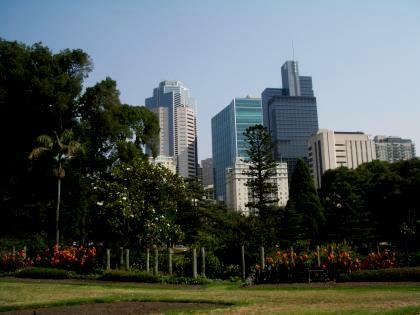 In the afternoon we got on the free city circle Trams reminding us of San Francisco and got of for a walk in the Carlton Gardens and a snooze in the grass in the warm afternoon sunshine. Temperatures were up to 25c. In the evening we returned to the Yarra Promenade for a meal where Martin and Peter T had Kangaroo steaks. I decided not to offend the local wildlife and had Chicken.